Students at Ecole Heritage have learned about Christ’s sacrifices in their names. They attended a pre-Easter service at the Ste. Anne Paroisse in Falher during the morning of March 29. 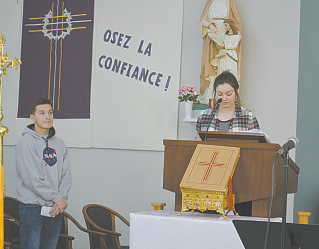 Deacon Reg Bouchard (at left) led the service in French and several students took turns reading biblical references. Also, several students brought offerings to the edge of the stage and Deacon Bouchard held communion for the gathered. Joel Lavoie led a group of students in performing songs for the service. 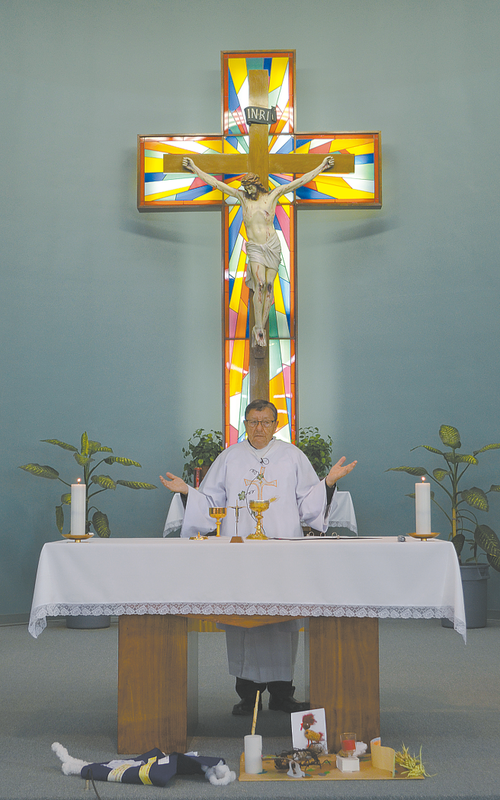 Grade 2 teacher Julie Desrosiers, one of organizers, noted the students also participated in chemin de croix, or the ‘Way of the Cross’, earlier in the week. This consisted of 12 activities to understand the burden that Christ endured prior to His Crucifixion. Chantal Roy’s Grade 9 students organized these activities. 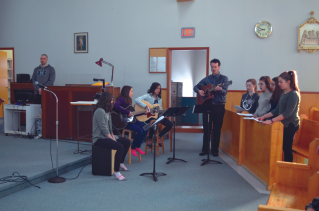 Joel Lavoie leads Alexanne Fillion, Nadia Lavoie, Meera Sylvain, Isabelle Nicolet Thibault, Danika Aubin, Brooke Lambert and Mia Maisonneuve in several songs for the pre-Easter service at the Ste. Anne Paroisse. Eric Dentinger, left, and Zoe Tardif taking turns reading biblical references.